Dive into Telluride’s rich history at the Telluride Historical Museum, located at the very top of North Fir Street. With ever-changing exhibits focusing on the varied topics of Ute Indians, mining, skiing and festivals, the Historical Museum is a must for anyone who wants to understand the robust past of this little town. Visitors can also participate in a historic walking tour of Telluride, an active way to explore and learn. Admission is $5 for adults, $3 for students (ages 12-17), $3 for seniors (65 and older) and free for children under the age of 12. Telluride’s Wilkinson Public Library offers many things to both locals and visitors alike: a gathering spot, a quiet respite, a bountiful source of books, movies and workshops. It’s a wonderful hub for everyone in Telluride and guests are encouraged to visit. Weekly story time for young ones is held in the fabulous Kids Area. The Library also hosts various classes for kids and teens including cooking classes, chess club and outdoor club. For adults, take advantage of the free yoga and Zumba classes held daily. Foodies, listen up! Telluride boasts countless fantastic local eateries, but it can be tough to experience them all during your vacation here. Enter Telluride Food Tours, the brilliant creation of Britt Havard and Kenny Doerrer, two food-obsessed locals who want to share their passion for delicious eats. For a fun, out of the box Telluride experience, let us book a Food Tour for your entire group (up to 16 people.) 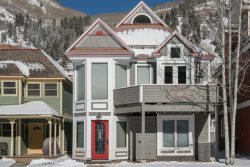 A local tour guide will lead the group around town to taste a delectable sample of Telluride’s finest dishes and learn fascinating tidbits about Telluride’s rich history. You’ll enjoy enough food for a light dinner, depending upon your appetite. This is a guaranteed crowd pleaser for everyone in your group. Sheridan Opera House: Located in the heart of downtown Telluride, the Sheridan Opera House serves as venue for live music, comedy acts, theater productions and intimate private parties. If you’re hoping to see live music while you are visiting Telluride, be sure to check out the rotating calendar of events for the latest schedule. The Nugget Theatre: Catch a flick while you’re in town at the historic Nugget Theatre located on Main Street. From independent films to big-name blockbuster hits, the Nugget features an ever-rotating schedule of great movies. To find out what’s playing, check out the schedule on the Nugget’s front window or log on to the Nugget’s website here. The Michael D. Palm Theatre: Located on the campus of Telluride High School, The Palm hosts a variety of artistic performances including live music, theater productions and film screenings. For a full calendar of events, log on to The Palm’s calendar here.